What If Disney Princesses Were More Diverse? It’s beautiful to see such a diverse twist on the mostly white ladies; perhaps Disney will take a cue for its next animated heroine? 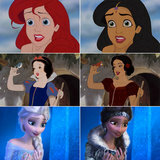 Click through these ethnically diverse Disney princesses now!